Single-game tickets are now available to the public for Sun Devil Football’s contest against the Texas Tech Red Raiders on Saturday, Sept. 10 at Frank Kush Field/Sun Devil Stadium in Tempe. TEMPE – Single-game tickets are now available to the public for Sun Devil Football’s contest against the Texas Tech Red Raiders on Saturday, Sept. 10 at Frank Kush Field/Sun Devil Stadium in Tempe. The second non-conference tilt of the season for the Sun Devils is scheduled for a 7 p.m. AZT kickoff. The game, presented by Hyundai, will pit the Sun Devils against the Red Raiders in their first match-up since the 2013 Holiday Bowl and just the third time in history. Fans are encouraged to wear gold as the team celebrates Faculty/Staff Appreciation Night & City of Tempe Night. Sun Devil Athletics will also maintain the rollout of on-sale dates for single-game tickets that began in 2013. The three-day plan begins four weeks before every home game, and starts with select groups on Tuesday and culminates with the general public on Thursday. Sun Devil Football is excited to announce several giveaways taking place during the 2016 season, beginning with the Texas Tech game. Giveaways will be available at the game on a first-come, first-serve basis to Sun Devil Football season ticket holders, as well as to fans purchasing group tickets or special ticket packages. Further details on pick-up locations for giveaways will be provided prior to the games. The giveaway for the game will be a clear drawstring backpack, fitting with the new clear bag policy implemented for the 2016 season. Fans are encouraged to call the Sun Devil Ticket office at 480-727-0000 for more information involving their ticket needs. Subscribers of Devils’ Insider have first access to single-game tickets on the Tuesday of each on-sale week. CLICK HERE to subscribe to Devils’ Insider. Tickets will then become available to followers of Sun Devil Athletics’ social media outlets on Wednesday before being offered to the general public on Thursday. Season ticket holders and Sun Devil Club members have had access to purchase single-game tickets for all home games since July as a benefit of their continued support. Tickets are also available for each of ASU’s six road contests this season. The Devils will hit the road for the first time this year for a non-conference matchup against the University of Texas at San Antonio on Friday, Sept. 16. The Sun Devil Club will be hosting a fan getaway for the weekend featuring a two-night stay in San Antonio. The Pac-12 slate will set the Devils up for five road tilts, featuring games at USC, Colorado, Oregon, Washington and the Territorial Cup battle at Arizona to close out the regular season. Fans are encouraged to arrive early and greet the team at Devil Walk, which begins two and a half hours before kickoff inside Wells Fargo Arena. Devil Walk features the 2016 team, the Pride of the Southwest Sun Devil Marching Band, the Spirit Squad, special videos and highlights, and more. The west sideline is only available for Season Tickets and Mini-Plans. Season Tickets are currently on sale and will be available up to kickoff of Sept. 24 against Cal. Mini-Plans are currently on sale and are broken into two different packages. Group tickets are available for every game and begin at a 20-ticket minimum. Group purchases also include benefits, such as the gameday giveaway and other opportunities to participate in special gameday programs. Season tickets are currently on sale until Sept. 24 at www.sundeviltickets.com, by calling the Sun Devil Athletics Ticket Office at 480-727-0000, making an appointment with a Sun Devil Sales and Service staff member, or visiting the Sun Devil Ticket Office, located on the south end of Sun Devil Stadium. The ticket office is open from 9 a.m.-5 p.m. Monday through Friday. Click here for pricing and more information about Sun Devil Football season tickets. Use ASU’s Mobile Delivery option and simply present your smartphone with tickets at the gate to avoid standing in line at the will call window on game day. Choose Mobile Ticketing as your preferred delivery method when ordering tickets and they are delivered as a PDF or Passbook specifically designed for smartphones, so you don’t even need to print your tickets. The SDA Ticket Office, based on last year’s success, will once again extend its hours during football season and will be open on Saturdays from 10:00 am – 2:00 pm beginning August 13. On home football game days, the ticket office will be open from 10:00 am through the end of the third quarter. Phones will be available from 10:00 am until 4 hours prior to kick-off and fans can also continue to live chat with the Sales and Service team via thesundevils.com. While Sun Devil Athletics is reinventing Sun Devil Stadium, access points on the south side of the stadium have CHANGED for the 2016 Sun Devil Football season. These changes are temporary and when the reinvention of Sun Devil Stadium is complete, there will be a 360-degree concourse, enhanced concessions and restrooms, and a better game-day experience. 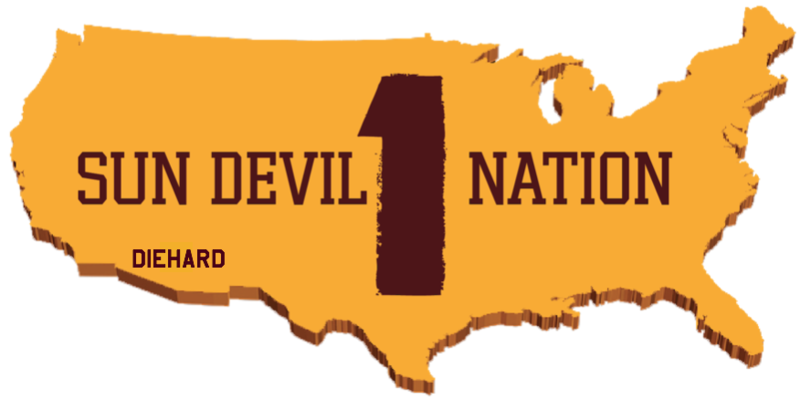 Visit www.thesundevils.com/findmyseat for information on how you can access you seats in 2016. Fans are encouraged to arrive early on game days in order to identify access points to seats as some have changed. Also, Sun Devil Athletics is instituting a NEW Clear Bag Policy for all fans visiting Sun Devil Stadium. The new policy was created to increase the security of fans and to enhance the Game Day experience. Visit thesundevils.com/clearbag for more information on permissible bags and FAQs on the new policy. We appreciate your patience as we work to reinvent Sun Devil Stadium into one of the premier game-day experiences in the nation. The Sun Devil VIP Tailgate, an exclusive tailgate zone located in the Arboretum in the Sun Devil Club plaza, directly north of Wells Fargo, has reopened for all six home games of the 2016 Sun Devil Football season. Click here to purchase tickets and click here for more information.